Ever wonder why we have streets named Killdeer and Kingfisher? It turns out we have some great habitat for these cool little birds. At the intersection of Augusta Shores Drive and Killdeer Drive, you might notice that the ditches are mostly small gravel and rocks. This is ideal Killdeer habitat. This habitat has been carefully preserved so that we have the privilege of seeing these creatures. They nest in rocks and their eggs are camouflaged to fit right in. You have to look hard to see a killdeer nest. You can occasionally see them running around in the summer, but you have to be quick, because they are, too. Killdeers are found through most of the U.S. This is a picture of a killdeer. To hear a killdeer call, click here. Kingfishers belong to the order Coraciiformes which are large headed, short necked, short legged and mostly large or long billed. Their feet are rather weak and their toes short with one or more partly joined for some or most of its length. The tail is moderately long. Plumages are bright mainly in iridescent or pigmented greens and blues. There is seldom much plumage difference between sexes and age. They all nest in holes their eggs are unmarked and white and the young hatch naked and blind. There are 86 species of kingfisher distributed throughout the world and many sub species. Kingfishers occur on every continent except the Arctic and the Antarctic. We have kingfishers that nest in sand banks near the big dam. What we have here in Augusta shores are probably Belted Kingfishers, as pictured here. One of the more ubiquitous birds around the development is the turkey vulture. It's a beautiful sight when seen soaring high above, but not widely admired when seen up close on the ground. With a wingspan of up to six feet, the bird can glide for hours, barely flapping a wing, riding the thermals and circling to get to even higher wind currents. 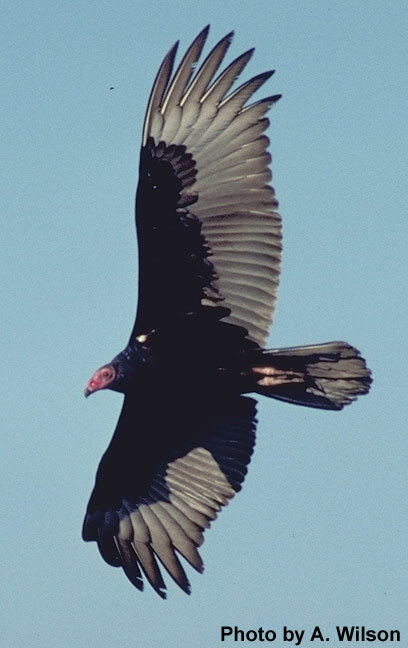 Contrary to popular belief, turkey vultures do not circle dying animals. Turkey vultures are highly social animals and often roost communally; the have no song but sometimes hiss and grunt at their prey. The male Indigo Bunting is a rich, deep blue all over, but may appear dark and blackish in poor light. Females and young indigos are mainly brown in color with only a few blue streaks on their tail. They measure from 11 to 13 cm. in length and have a short beak like sparrows. Indigos will eat a variety of foods from insects to seeds, berries to herbs. The female indigo bunting will call but not sing. Male songs have to do with territory, breeding, warding off invaders, and feeding. Their song is composed of loud, strident high-pitched notes that are often delivered in pairs. A popular memory-phrase for the song is "fire-fire, where-where, here-here, seeit-seeit." Indigo Buntings frequent forest clearings and second-growth habitat in the East and Midwest. We have many other species of birds from Carolina Wrens to Cardinals to Whippoorwills and we hope to feature more of them on this site as time goes on. If you are interested in bird watching - here is a good Beginners Guide to Bird Watching: http://www.homeadvisor.com/r/birdwatching-guide . Thanks to the kids at the Open Media Library for this tip. Otters - The Missouri Department of Conservation has a document specifically relating to otters. You can go there by clicking here.